New US Open champion Naomi Osaka can become Japan's first world number one, says Japanese former Grand Slam semi-finalist Kimiko Date. The 20-year-old's straight-sets win on Saturday was overshadowed by Serena Williams' outbursts at the umpire. "If she continues to develop the way she has over the past two weeks, she can go on to be Japan's first world number one," added Date. "To keep your cool like that, from the moment you step onto court to the last point, isn't easy." Osaka - who was born in Japan and raised in America - has climbed to a career-best seventh in the world rankings after her win in New York. Date, a Wimbledon semi-finalist in 1996, expects Osaka to emulate the achievements of China's two-time Grand Slam winner Li Na. Former word number four Date said: "Osaka is taking on the power tennis of the women's game with power of her own - an Asian player, a Japanese player. "Until now only Li Na [of Asian players] had the physique to be able to tackle that kind of power. "You could tell Serena was wary of Osaka's power." Williams was given a code violation for coaching, a penalty point for racquet abuse and finally a game penalty for calling the umpire a "thief" and "a liar" . Osaka remained composed throughout Williams' repeated on-court protests as she ended the 36-year-old's bid for a record-equalling 24th Grand Slam title. But she became overwhelmed by emotion during the trophy presentation as boos - seemingly aimed at the umpire's decision to penalise Williams - rang down from the stands, prompting Williams to ask for the crowd to "give credit" to Osaka. "I'm sorry it had to end like this," a crying Osaka said as after she'd been presented with her trophy. "It was always my dream to play Serena in the US Open finals so I am really glad I was able to do that." Williams was a childhood idol of Osaka's and the new US Open champion even wrote a school report on her. "It's a little bit crazy," said Osaka. "I feel like I'm a big kid that doesn't really understand how the world works, because mainly I've just played tennis my whole life and I haven't really thought much of anything else." "I woke up and I was sweating. I was so nervous, my heart was racing the entire day. I think that wasn't good for my health," she said. "Since she's in Paris, she was showing me these random croissants and baguettes to try to take my mind off of it, and it kind of worked." Osaka's profile has soared in Japan, with Prime Minister Shinzo Abe tweeting his pride on behalf of the nation. Abe thanked her for "giving Japan a boost of inspiration at this time of hardship" - an apparent reference to last week's deadly Typhoon Jedi and the Hokkaido earthquake that killed dozens of people. 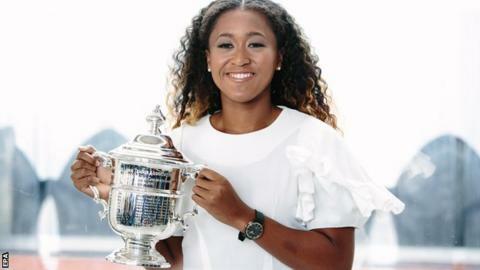 Osaka is scheduled to head straight from New York to Japan to play in the Pan Pacific Open, which begins on 17 September, a tournament now billed as a "homecoming" for the new US Open champion. The Yomiuri newspaper said Osaka was a "new heroine" while Japanese men's tennis player Kei Nishikori posted his support for his compatriot in a number of tweets.